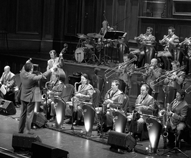 Famous Big Band charts from the swing era and beyond. A range of famous big band charts from the swing era and beyond, from well known band leaders such as Glen Gray, Buddy Morrow, Buddy Rich, Gene Krupa, Charlie Barnet, Woody Herman, Billy May, Jimmy Dorsey and other greats of the big band era. All of these charts have been lovingly transcribed from original recordings and will sound really authentic when you play them. They range in difficulty from Easy to Advanced, so please check their individual descriptions for more information. What are some of the famous charts you'd know? Included in our selection are charts such as "Leave Us Leap" and "Rockin' Chair" from Gene Krupa, "Skyliner" and "Cherokee" and "Pompton Turnpike" from Charlie Barnet, "The Jazz Me Blues" and "Woodchoppers Ball" from Woody Herman, "Contrasts" from Jimmy Dorsey and "Lean Baby" from Billy May. All of these charts have been lovingly transcribed from original recordings and will sound really authentic when you play them.